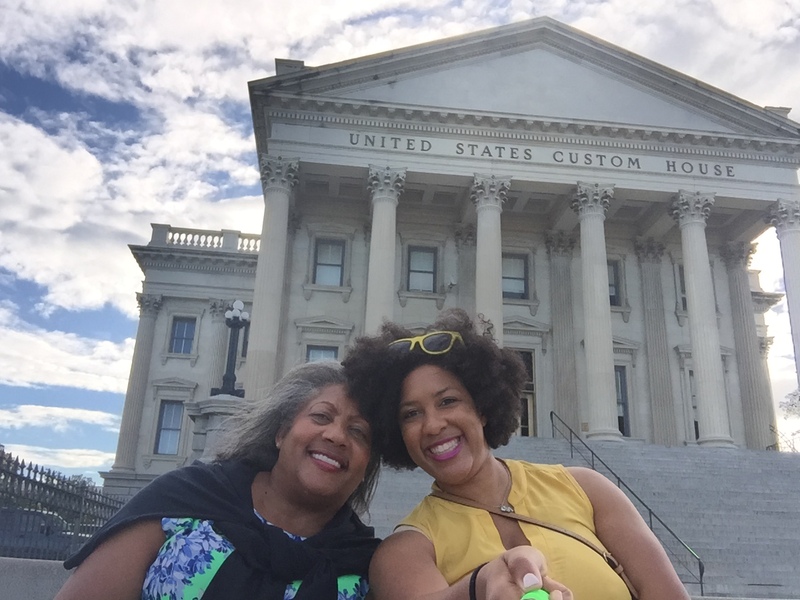 India and I recently spent a delightful weekend in Charleston, South Carolina. The occasion was the Opening Reception of the 9th Annual African American Fiber Art Exhibit. My quilt Strength and Grace was part of the exhibit. India and I have traveled together a lot. She is always a good sport about her Mommy’s quilting activities where she is usually the youngest adult in the room. During our travels, she is designated chief chauffeur, fabulous photographer and food finder extraordinaire. Charleston was no different. We had beautiful weather during our drive to Charleston. Unfortunately, we were not blessed with good weather for the entire weekend, but our spirits were not dampened in the least. We got an early start so that we could make our ritualistic stop at Cracker Barrel for breakfast. We arrived at the exquisitely beautiful Mills House hotel with time to explore before the opening reception at North Charleston City Hall. Downtown Charleston has great shopping and cute little wine and cheese bistros. Strength and Grace looked beautiful among the other quilts in the exhibit, and our hosts made us quilters feel like celebrities. Each quilter received a bracelet from the Straw Market. The exhibit was extra special to me because it was in North Charleston City Hall, and my professional life as a public servant has always intersected with my quilts. 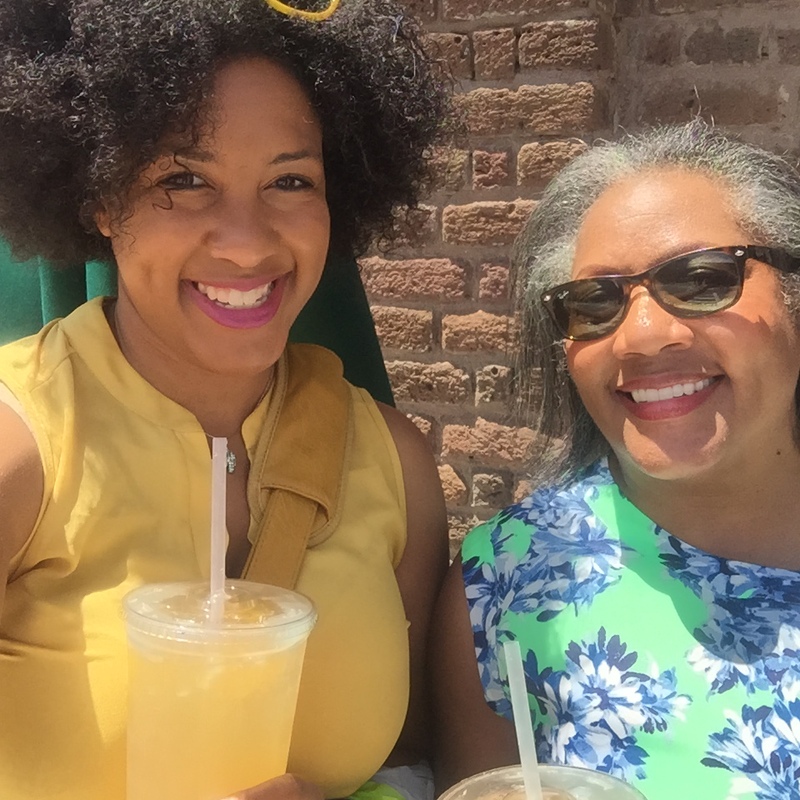 After the official business of the quilt exhibit was taken care of, we spent the weekend exploring and eating all over Charleston. Charleston is definitely a “foodie” town, and there is a lot to see and do. We checked out the Slave Market Museum, the straw market and had dinner on the water front. 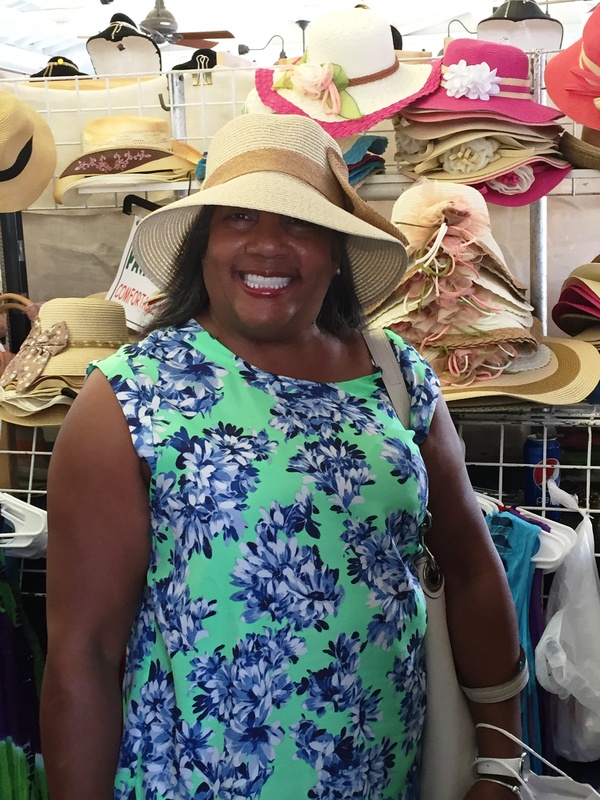 We checked out historical buildings, and we shopped and shopped. The most notable purchase was a Selfie Stick I am embarrassed to say. Our weekend was much too short so we plan to return. Charleston is a great place to go with no set agenda and so that you can just go where the city leads you. Did I mention it was Mother’s Day weekend? Yes, I am feeling blessed. She just had to buy a Selfie Stick! Me with Moon Pie. 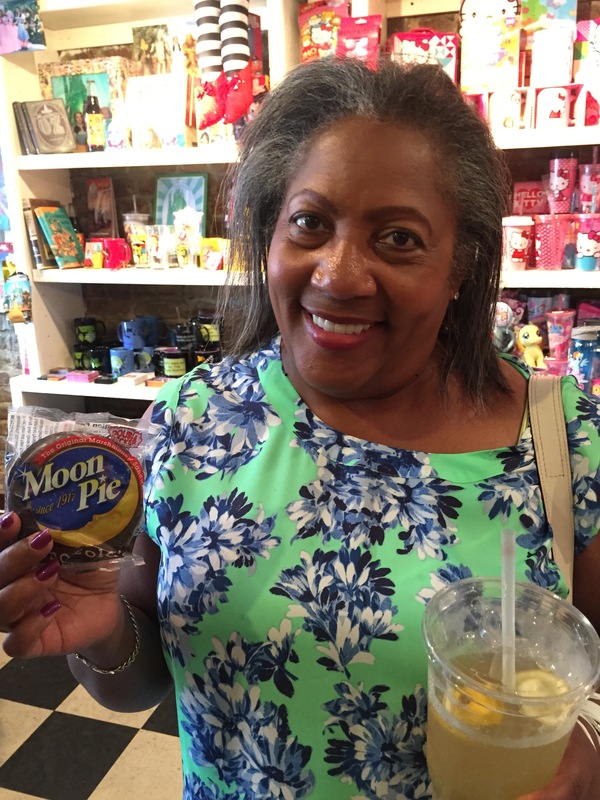 I loved Moon Pies when I was a girl. 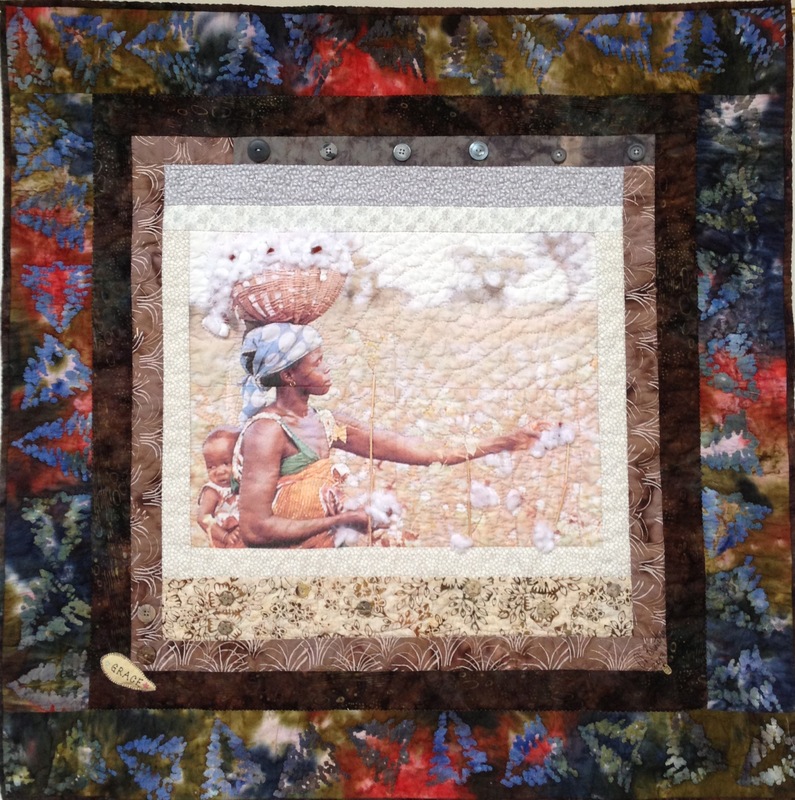 This entry was posted in A Quilter's Life, Quilt Travels and tagged 9th Annual African American Fiber Art Exhibit, Charleston, India Brantley, Strength and Grace. Bookmark the permalink. Great peace OV: I participated last last year. When I was driving professional out of West palm beach, I hit the sticky finger bar b que joint there, the platter they serve is for 300 pounders.